Who knew a mud ball could be transformed into an object of beauty? The Japanese, of course! 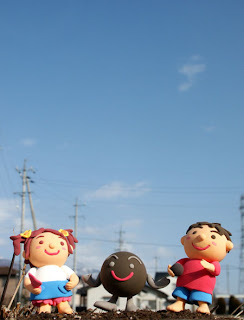 Kids across Japan are crazy about making what's known as hikaru dorodango. These simple, lovely handmade spheres can be crafted from most varieties of mud and require nothing but time and attention to detail. Even the ones shown above are 100% natural. They contain no other ingredients other than a little wet soil--no polish, no chemicals, no paints. 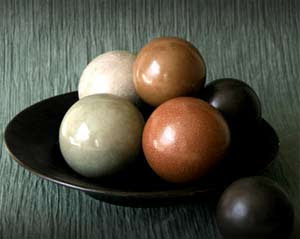 Simple instructions for making your own dorodango can be found here. (Just scroll down to the bottom of the page.) Experiment with different kinds of mud, and you'll end up with a range of colors. i love it! Did u get this from Japanorama (see April 11 post)?